I am not a scientist. Nor am I a policymaker or a philosopher. You’ll find no Ph.D. after my name. I am not here to scale the intellectual heights of God’s creation. Rather, I have come to report to you from ground level, where grand visions crash head-on into everyday realities. I am a teacher. For 15 years, I taught secondary school in Texas and New Mexico, two of the seven states that adopted the Discovery Institute’s suggested change to science curricula, which requires teaching the controversy about evolutionary theory (1) . I hold certifications in English, math, social studies, special education, and ESL (English as a Second Language). I mention my qualifications not just in the interest of full disclosure, but also to note that I don’t have any particular axe to grind. I have no academic reputation to protect. I am not an angry science teacher. I promote no blog, seek no followers, tweet no opinions. What I do have, however, is firsthand experience of the practical problems that prevented the Discovery Institute’s Science Education Policy from achieving its ideal in real-world science classes (2) . "The vast majority of teachers preferred to avoid the controversy as much as legally permissible..."
Consider, for example, the reaction of teachers when states change their science curriculum to teach the controversy about evolution. In Texas, where we suffered prolonged and bitter battles over textbooks and curricula, the great majority of science teachers wanted nothing to do with controversy, whether of the political or evolutionary stripe. The teaching of evolution, already a sensitive topic because of the constant threat of litigation by non-religious parents, was more politicized than ever when the state adopted Discovery’s suggested approach in 2009. Any teacher with an ounce of common sense and an instinct for self-preservation could not be blamed for doing the bare minimum to prepare their students for the one or two “controversy” questions that might appear on a standardized test. It was in a teacher’s best interest to say as little as possible and quickly shift discussion to less radioactive topics. There were few extended discussions, little real analysis, and hardly a whiff of critical thinking. Political victory at the Texas State Board of Education translated into less discussion of the strengths and weaknesses of evolutionary theory, not more. Unfortunately, this was the best outcome. Other science teachers – around 10% by my estimate – proved actively hostile to the change in the science curriculum. These unsympathetic teachers didn’t exactly teach the controversy, as Discovery hoped. Instead, they presented a few simple objections to evolution, then proceeded to demolish and ridicule those objections, leaving students with the unspoken impression that only simpletons believed in design. By the letter of the law, these teachers conducted analysis and encouraged critical thinking in their students, but the outcome was certainly the opposite of what the Discovery Institute intended. It’s hard to call this a “victory” in any sense, especially for the students in those classrooms. Were these kids simply collateral damage in the culture wars? It’s a question we should ask ourselves. Besides those hostile to the new science curriculum, a slightly higher number of science teachers were actively enthusiastic about the change. Remember, we are talking about Texas, where 25% of the population are evangelical Christians (as I am). Public school science teachers can fall into that category, too. How many of the enthusiasts actually were qualified to have a critical discussion of the strengths and weaknesses of current evolutionary theory? Not enough. Far too often, the teachers who most enthusiastically welcomed the opportunity to discuss strengths and weaknesses in evolutionary theory were the least qualified to hold that discussion. As hostile teachers focused on the strengths of evolutionary theory and scoffed at the critics, their counterparts on the Christian “home team” flipped the script. In Texas, the politics of curriculum change rendered “teaching the controversy” an afterthought in public schools. The vast majority of teachers preferred to avoid the controversy as much as legally permissible, while fringe elements on both ends of the spectrum took advantage of the opportunity to present their own religious (and irreligious) opinions cloaked in scientific garb. Is this really the desired outcome? Are we doing our children a service by “educating” them in this manner? While the problems that I have noted so far are based on personal experience and anecdotal evidence, the most glaring difficulty with the strategy of teaching the controversy is borne out by hard data (“empirical evidence,” as the scientists like to say). The Discovery Institute officially opposes the teaching of intelligent design in the classroom because most teachers would not be able to “teach it accurately and objectively.” This is true, although not for reasons the think tank probably had in mind. As a practical matter, public schools around the country cannot find enough qualified science teachers. The National Center for Education Statistics (3) reports that 26% of high school biology teachers do not hold a degree in biology, and 10% have neither degree nor certification in the subject. 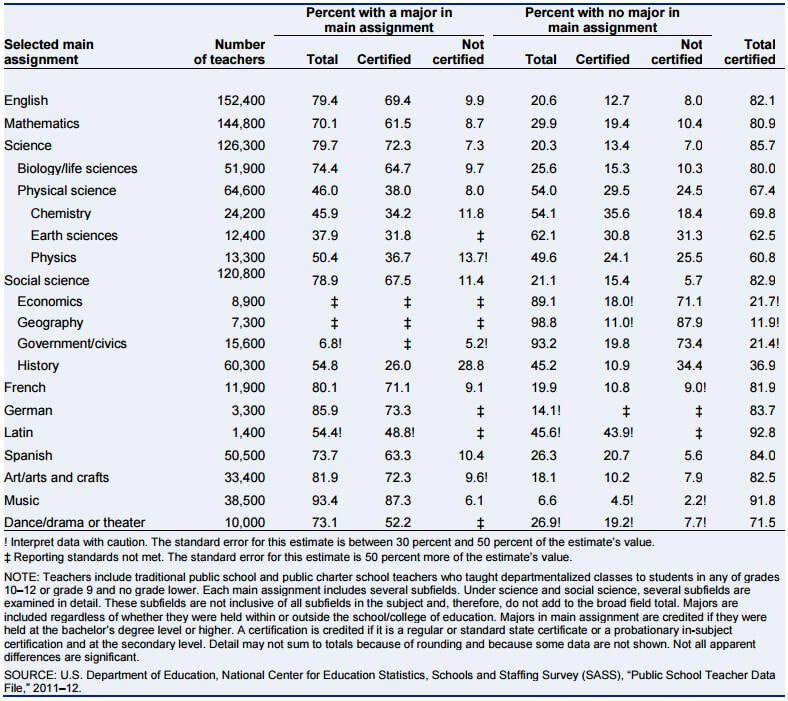 The numbers are even bleaker in the physical sciences, where less than 50% earned degrees in the subject they teach, and almost 25% have no qualifications whatsoever (see chart below). Rounding out the picture, it is important to understand how many teachers – 15% of biology teachers and 30% of physical sciences teachers – are certified to teach a subject but do not hold a degree in it. Almost all of them have passed a test to add that endorsement to their existing teaching licenses, and most of them switched to science simply because it was easier to find a job. A secondary issue was highlighted by that same NCES study, which showed that 43% of biology teachers teach additional subjects. Having taught multiple subjects to multiple grade levels too often, I can testify that a teacher in that position has less time to prepare lesson plans or research topics for in-depth discussions. Teaching two subjects means half as much time to prepare. It’s simple math. Add these problems together, and too many science classes are taught by teachers who are unqualified, stretched too thinly, or both. The public schools are facing a crisis far worse than an inability to teach intelligent design accurately and objectively. Many teachers can barely cover the basics of evolution and genetics, let alone hold an in-depth discussion of the “strengths and weaknesses of neo-Darwinian and chemical evolutionary theories.” They lack the background to adequately discuss the finer points of evolutionary theory, and they have neither the time nor the incentive to acquire that knowledge. Discovery’s dreams of critical classroom discussions on cutting-edge evolutionary theory are not coming true, at least not in any public school systems with which I am familiar. The same teachers who cannot teach intelligent design accurately also cannot “teach the controversy” adequately, and for the same reasons. Such practical considerations finally led Texas science teachers to demand change, simply because the 2009 mandate to “evaluate scientific explanations for the origin of DNA” required another two weeks of lessons to cover the material adequately, according to a 10-member panel of scientists and educators appointed to streamline the biology curriculum in July 2016. Ron Wetherington, a Southern Methodist University professor on the 10-member committee, told the Texas Tribune in April 2017, “‘Evaluate’ means you rank these scientific explanations in terms of how adequate they are, how complete they are, how many problems exist with them, what the evidence for each of the alternatives are. It takes a long time to do compared to just describing them.” Although earlier votes at the state board fell in favor of Discovery’s preferred term, a last-minute compromise replaced “evaluate” with “examine,” dealing the institute yet another setback in its quest to alter the way public schools teach evolution to ninth-graders. The practical issues hampering implementation of the “teach the controversy” approach should be obvious by now, but there is a final piece of the puzzle to consider. The Discovery Institute recognized that attempting to force intelligent design into the classroom would just politicize the theory, which would hinder a fair discussion of it in the scientific community. Those fears were well-founded. From my ground-level view, they look practically prophetic. Anyone with even a passing acquaintance with the political battles waged in state boards of education across the country knows that the efforts to change science curricula have achieved exactly the effect the Discovery Institute wanted to avoid: intelligent design and its theorists have been politicized, shunned, and demonized within the scientific community. Even when Discovery “wins” a curriculum battle, it loses. Only a small minority of teachers are both willing and able to cover the topic of evolution in the way that the institute envisions, and the political fallout from every struggle pushes intelligent design theory deeper and deeper into the scientific doghouse. The inescapable conclusion is that Discovery’s victories have been pyrrhic, at best. A change of direction clearly is overdue. Personally, I would mark it down 10 points for being late. After 15 years as a journalist and publishing executive, Jay D. Johnson chucked it all and spent the next decade teaching English in the juvenile justice system. He presently lives in New Mexico, where he taught special education.